Hello gorgeous. As a brunette, I'm partial to darker hues, but this blonde beauty proves that they really do have a lot of fun. We commissioned these beautiful, reclaimed planks into a custom designed dining room table. We're loving the result! The knots, the grain, even the splits from age and wear - I find new character each time I look at it. 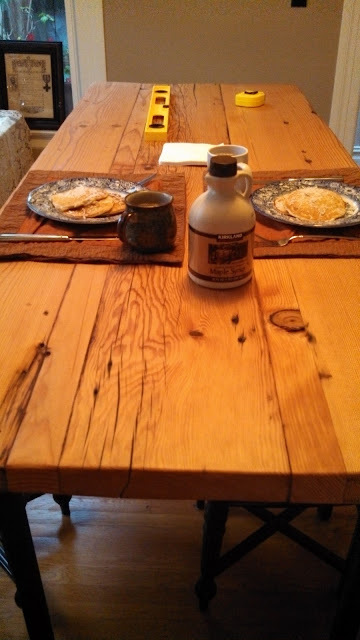 This is just a little sneak peek at the table. I have a lot more to share about the vision for the room, the commissioning process, etc. We still need quite a few pieces to finish off this room (stools, rug, hutch, accessories), but the the table is the cornerstone upon which we'll build the rest. 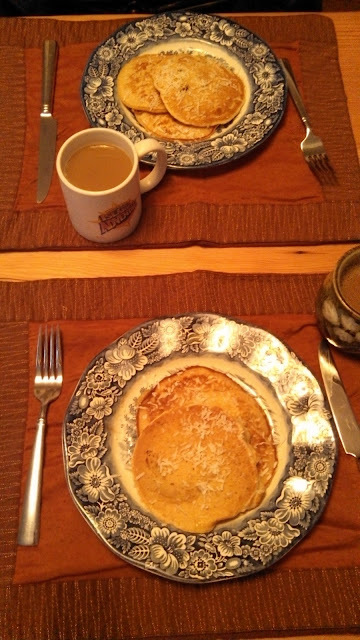 Until then, we'll just be enjoying our seared banana kodiak cakes and coffee. I’m a Defense Consultant with a tendency towards pulling office pranks, taking lunch breaks, and drinking Wawa shakes. I’m also an English major with a serious obsession with alliteration and rhymes. While I’m not keeping America safe, I’m priming, sanding and painting. Or increasing our fresh veg intake. Or pontificating on my newly minted status as a wife. All the while, I’m getting myself into Lucille Ball-esque scrapes and making Jim Carey-esque faces. Post-wedding, I’m bringing blogging home to explore renovations, recipes, and reflections. Visit Melinda's profile on Pinterest.